Looking for a thankfully easy way to decorate the kids’ table? Add a personal touch with individual name tags. Print out the cards by clicking the “Download Here” link above. Cut the cards along the dotted lines and fold them in half. Then write in each guest’s name and set the name cards around the table. When it comes time for turkey, everyone will know their place at the table. 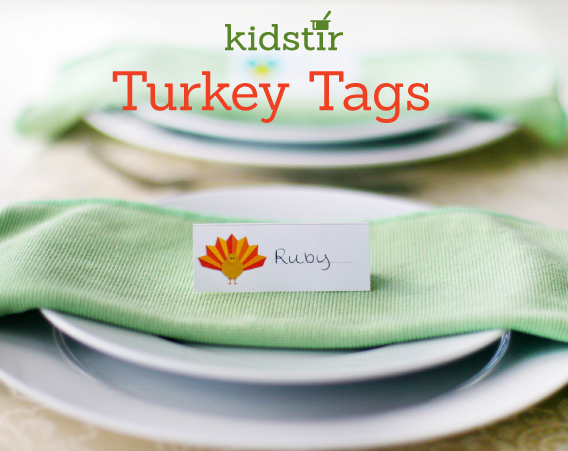 If the kids need some guidance with setting the Thanksgiving table, check out our kids table setting guide to help with the placement of the plate, utensils, a drinking glass and a napkin. And once everyone is seated, how about some printable conversation starters? If you haven’t gotten your Thanksgiving themed cooking kit for November, sign up to get our Subscriber Exclusive Gobbling Good Fixings kit, which has a colorful Kidstir apron and a silicone Spoon it Up stirring spoon to prep the meal!